It was a mealtime conversation in Rome while I was staying at the Venerable English College, the Venerabile. I was sat opposite a young priest from Malta who had come to Rome for further theological studies and was particularly interested in art history. He had just written an essay on art and the liturgy, and – well – the conversation flowed from there. Somehow we got on to the subject of baptistries – it wasn’t me, honest! He commented on how most of the early ones were octagonal. Now we are talking about the fourth century onwards when baptism was still usually administered to adults professing their faith. Often the baptismal tank would be housed in a separate building in the grounds of the church and this building, as well as the tank, is referred to as a ‘baptistry’. Now another historical note: the ‘eighth day’ was a concept developed by early Christian writers and it means Sunday. The term focused the meaning of the move for worship on the seventh day to worship on the eighth day. Now I know that a fair number of us have sometimes wished there were eight days in a week, but I know and the early church knew that there are in fact only seven. It’s a kind of paradox or nonsense phrase. Sunday is the Lord’s Day – the first day of the week – the day of resurrection. But the point is this – it is not just another day like the rest. Nor is it even just the first day of creation – it is the day of new creation when everything in heaven and on earth is changed because God has raised Christ from the dead. God’s future end, his eschaton, has broken into human and cosmic history and all the boundaries have been changed and expectations have been turned upside down. The young priest didn’t need to make the connection for me. The symbolism was so rich. ‘When anyone is united to Christ there is a new world’ – ‘We have been buried with him by baptism into death, so that, as Christ was raised from the dead by the glory of the Father, so we too might walk in newness of life.’ In baptism we celebrate the life-giving, life-changing work of God who raised Jesus to life on the eighth day – the first day of a new world. And those just baptized clamber out of the water to walk in a new world, a world of the eighth day, living in the light of the resurrection. All this is rich symbolism, great theology and inspiring sentiments. But… I wondered whether baptisteries were octagonal in order to express the eighth day – or because it was a nice shape which the architect thought would look good – or because an octagon is what you get when you put a dome on top of a square and do something artistic with the interior walls! Was it simply geometry or intentional symbolism? Or did the symbolism suggest itself once baptisteries had eight sides and someone made an imaginative leap? This conversation was a month ago but it was brought to mind by another geometry-symbolism bit of mulling this week. Between Venice and Assisi I took a two-day detour via Ravenna, courtesy of the slow train from Bologna to Rimini. 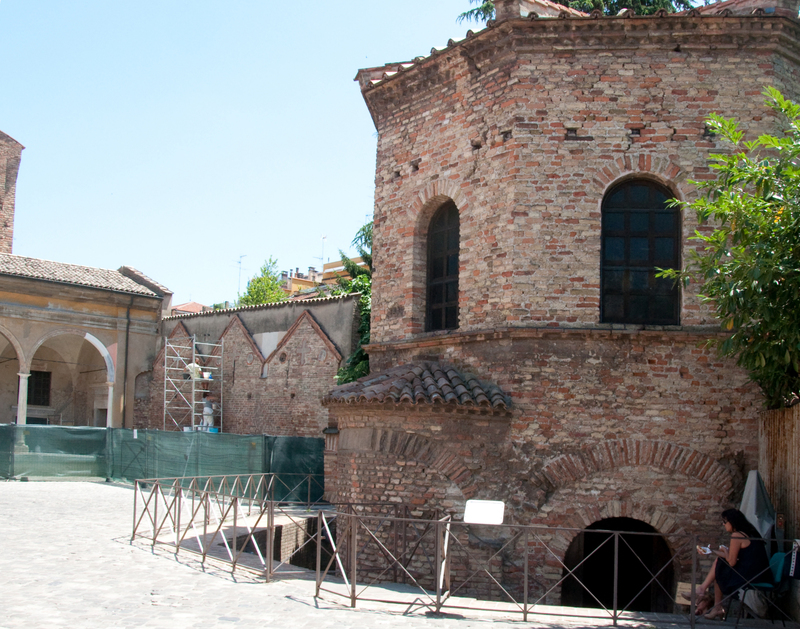 Ravenna was, for a time, the capital of the western part of the Roman empire, when it was being overrun by Goths and others. For a period it was rescued by the eastern part of the empire, based in Constantinople and in the fifth and sixth centuries a number of churches and, yes, baptisteries were built. The town boasts eight, UNESCO World Heritage sites – and on Tuesday I visited six, all within a mile of one another – and each with the most incredible mosaics. St Vitale is one of the largest buildings and – yes – it’s octagonal. Here is a photo I took of the image of Christ in glory which faces the congregation from above the altar. It is incredible that it was made in 548 – nearly fifteen hundred years ago. 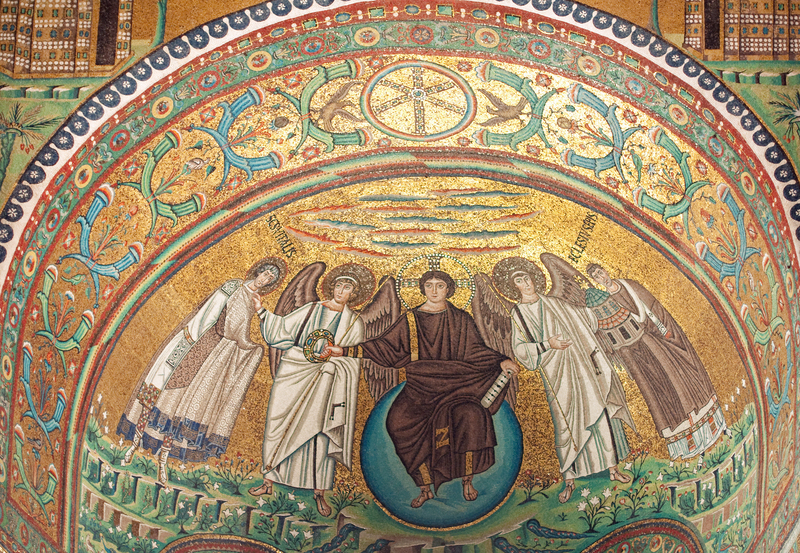 The mosaics in Ravenna are stunning and are claimed to be ‘the best Byzantine mosaics outside Constantinople’ (Istanbul). Back to my theme. 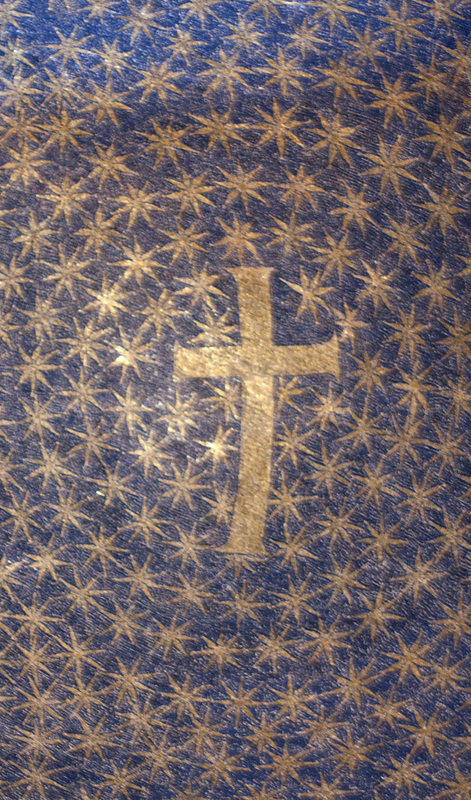 In two of the church buildings I found domes decorated as starry heavens – blue background with gold stars and a central gold cross. I sat in one chapel and gazed at this beautiful image. As I looked I realized that all the stars were eight-pointed! Now I think I was brought up in the belief that stars had five points – if you know what I mean. Then I thought, well, that’s just four lines imposed on one another – how I would normally draw an asterisk – geometry again. And then the geometry or the symbolism didn’t matter. For I was seeing not simply the stars but the cross. Here was the cosmic cross – the redemption of all things through Christ. Here was a claim about what kind of universe we inhabit – fallen, broken, but redeemed. Whether through geometry or intentional symbolism, here was an eighth-day realization that everything was different because of the cross and resurrection of Christ – all creation was to be seen in the light of the cross. For Christ is risen, the everlasting joy. heaven, and earth, and all places under the earth. All creation celebrates the resurrection of Christ.